Since we've done a number of cookbook posts now, I figured that I would put together a little index page for the sidebar. This is that index page. As I'm sure is the case with most foodies, we have a lot of cookbooks. The picture above shows a cross-section of just a couple of the shelves we have devoted to this obsession. 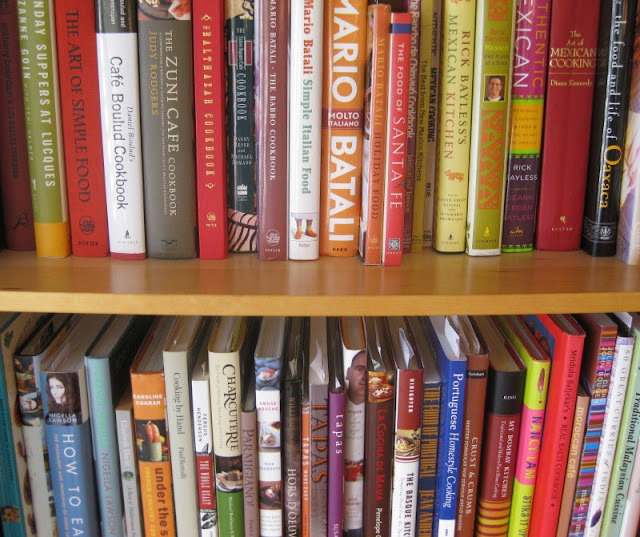 We thought it might be fun to highlight some of our favorite cookbooks and recipes from them that we like. 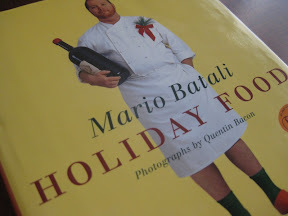 Italian celebrity chef and über-restaurateur Mario Batali has quite a few cookbooks out these days. This one is probably our favorite. A collection of recipes traditionally served during Christmas and New Year, it isn't a very large cookbook but there are some real gems in it. 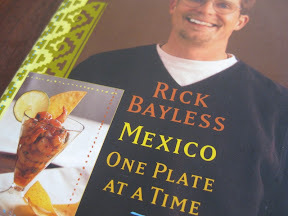 Bayless is one of the more prominent voices heralding the delicious diversity of regional Mexican cuisine. All of his cookbooks are good, but this one, designed as a companion cookbook to his PBS series of the same name, is the one we use most frequently. 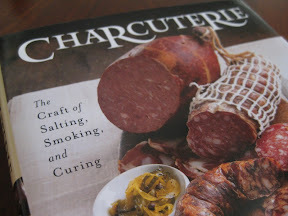 A great starting point for anyone looking to take a step into the wonderful world of cured meats. And trust me - you do want to take a step into the wonderful world of cured meats. Warning, though, this hobby can easily become an obsession. The signature cookbook of the famous Manhattan restaurant. We've never been to the restaurant, but we love the book. 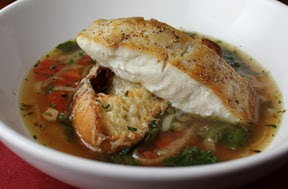 In particular, we love it for its selection of excellently detailed recipes for delicious fish dishes. 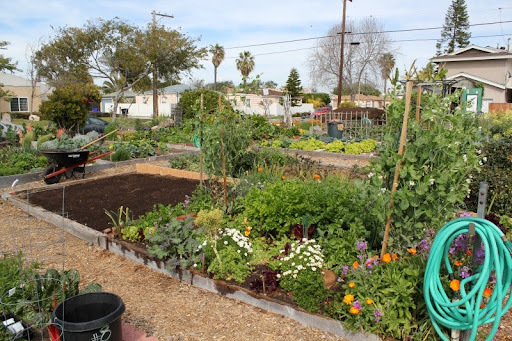 All new gardeners at the Pacific Beach Community Garden are initially given a half-sized plot. As you can see on the right of the picture above, ours is pretty full. What to do about it? Annex the plot next to us, of course! The timing was perfect, since the garden just got a load of compost in. We've turned the soil in the new plot, mixed in compost, and now we're ready to get planting. It will be great to have the extra space as we start ramping up toward summer. 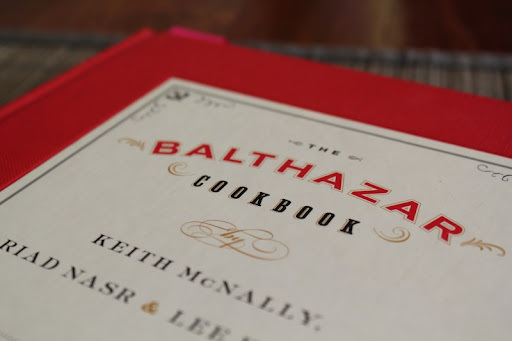 The Balthazar Cookbook is perhaps our single favorite cookbook for fish recipes. Named after the well-respected restaurant in Manhattan, it is certainly not specifically about fish, but for us it is those dishes that really shine. It also happens to be one of the best written cookbooks we have. By that I don't mean it is full of witty banter (not that I am at all averse to color commentary in a cookbook), but rather that the recipes themselves are superbly detailed and easy to follow. Not the hurriedly mal-adapted and underspecified instructions you often get in a restaurant cookbook. When making fish dishes from these recipes and others, we do not generally worry about using the precise fish specified. Instead, we use what we can get locally that fits the style of the dish. This was our first go-to dish from the book. The rich broth is what makes it - reduced until it is very intense, full of flavor and reminiscent of a French onion soup. It is like getting a soup and a main course all in one. A dish we keep coming back to. 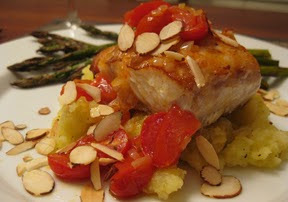 There is something super-satisfying about the way the potatoes, tomatoes and almonds taste together and how they accent a perfectly cooked piece of fish. As tasty as it is beautiful. The intense green from the parsley dominates visually, but doesn't overpower the other flavors. The sweetness of the corn and caramelized onion is wonderful. 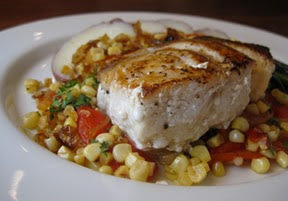 We are looking forward to corn season to again be able to make this dish with freshly-picked corn. Maybe from our own garden, this year? 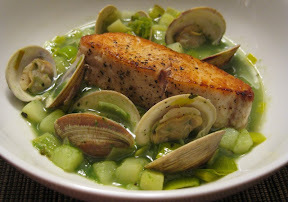 Just to prove that there are non-fish dishes in the book. 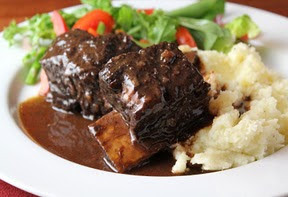 Short ribs may be a bit cliché these days the way they seem to be strewn across most every restaurant menu. This is for a reason, though - they are fantastic.